Currently at the Tasmanian Museum and Art Gallery, there is a display of baskets woven by aboriginal women, some dating from the 1840’s (See new article here). The exhibition is called Tayenebe, which means ‘exchange’ in the language of the south eastern Nueonne people of Bruny Island, and reflects the centuries of different cross and intercultural interactions based on the making and collecting of Tasmanian Aboriginal fibre work. While the impetus for the tayenebe project has been the desire to reconnect with the cultural craft of ancestors, it also opens a window into Tasmanian ethnobotany (the study of plants as it relates to ethnic cultures). Basket weaving is an ubiquitous theme in ethnic cultures worldwide. Baskets, woven by fibre-plants available as part of the natural vegetation, were held in high regard by aboriginal women and served very practical uses like holding shellfish, eggs and other foodstuffs. That is where the ethnobotany comes into the picture. 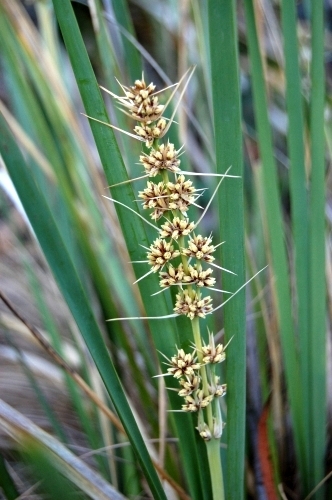 The Tasmanian aborigines used a large number of very common sedge and sedge-like plants in their basket weaving. Examples of these are usually members of the Flag irises (Diplarrena spp. ), Flax lilies (Dianella spp. 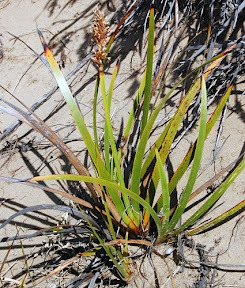 ), Sagg (Lomandra longifolia) and sedges of the genus Lepidosperma, a large genus of plants commonly known as swordsedges. I noted from perusing the exhibition and the publication Tayenebe: Tasmanian Aboriginal women’s fibre work accompanying the exhibition an incomplete list of the plants used by the Tasmanian aborigines for basket weaving. This I have produced below and will update as I find more references. In addition to sedges and sedge-like plants, the aborigines also utilized fibres from some flowering shrubs and trees as well. The common name of Pimelea nivea, Bushmans Bootlace, alludes to the fibrous nature of the bark of the shrub. Some of the exhibits in the Tasmanian museum were made in modern times and were further adorned by shells and vines of other plants like Golden Dodder (Cuscuta tasmanica. Did the aboriginal women of times past adorn their fibre work likewise? Perhaps it doesn’t matter. I imagine that life, with each passing generation, will bring adornments and improvements to this ancient craft, as long as there are those who keep the knowledge alive. I am David Tng, a hedonistic botanizer who pursues plants with a fervour. I chase the opportunity to delve into various aspects of the study of plants. I have spent untold hours staring at mosses and allied plants, taking picture of pollen, culturing orchids in clean cabinets, counting tree rings, monitoring plant flowering times, etc. I am currently engrossed in the study of plant ecology (a grand excuse to see 'anything I can). Sometimes I think of myself as a shadow taxonomist, a sentimental ecologist, and a spiritual environmentalist - but at the very root of it all, a "plant whisperer"! This entry was posted in Ethnobotany, Events and tagged aboriginal craft, aboriginal women of Tasmania, basket weaving, baskets, Ethnobotany, fibre plants, Tasmanian aborigines, Tasmanian ethnobotany, tayenebe. Bookmark the permalink. Fantastic blog! Thanks very much. Really appreciate your work. Just wanted to query the inclusion of Lomandra as a basket weaving material – looks like it should be but I have heard it wasn’t used. Thanks for your compliment. I got the checklist of those plants used for weaving from that little book published by the museum. In any case, I imagine that Lomandra would make for very material for weaving. Cheers. I found this list of plants used for fibre really useful. I’ve been working with a project examining the construction of the PNG string bag (progress so far to be found on the website given above) and am now turning attention to the Aboriginal versions. It is interesting that some of the same looping techniques are used, but extended into using the string for knotted nets and basket making. I’m also looking out for dye plants. re: Lomandra and weaving use in Tasmania pre 1900 by Tasmanian Aboriginal women. Lomandra was found only as a couple of strands within the weave of one of the 47 surviving baskets from historic times – which suggests that at least for those weavers at that time and in that twined [not coiled] basket style Traditional here in Tasmanian Lomandra was not really favoured. Most utilised were and still are Diplarrena m and Dianella t in Tasmania by local Aboriginal women. Thanks Julie, that is great info! I have heard somewhere else also that certain vines eg. Clematis were also used for twine, if not for weaving then for some kind of rope. I’d love to know if you know anything about it.